Genuine LG rechargeable lithium ion battery. Long storage life and can get charged fast. Perfect for your e-Cig MODs. LG HG2 18650 3000mAh Li-ion Battery- 20A, genuine LG product! LG HG2 18650 Li-ion batteries have a high capacity of 3000mAh and can support a maximum load of 35A, making it perfect for low sub-ohm resistance vaping on your favorite mod. You can use it with WISMEC Skyladon Mechanical MOD, Aspire Pegasus Box MOD, and any other mods working with 18650 battery! LG HG2 18650 3000mAh Li-ion Battery - 20A, genuine LG rechargeable lithium ion battery.Long storage life and can get charged fast. Perfect for your e-Cig MODs. Li-ion Batteries may explode if you do not charge or discharge them properly. Please note that due to their inherent safety, IMR cells don't have a protection circuit built in. They should never be discharged below 2.5 volts or cycle life/performance will be reduced. Maximum charge voltage is 4.25 volts. 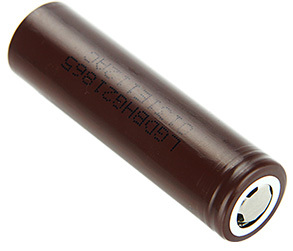 2 pcs 18650 batteries with Big Capacity - ENOOK 3600mah Safe and Reliable.